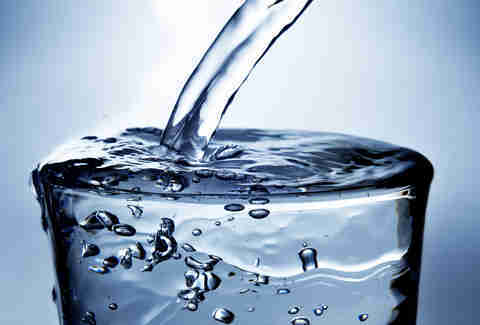 You've heard that your body is largely made up of water, and you know you can't survive more than a few days without it. Beyond that, hydration gets a bit hazy, and all the chatter about it may occasionally give you an uneasy feeling that you've been doing it all wrong. Since you’re still, you know, alive, you’re probably hydrating just fine. But to give you a little peace of mind, we got to the bottom of five of the most common hydration myths. 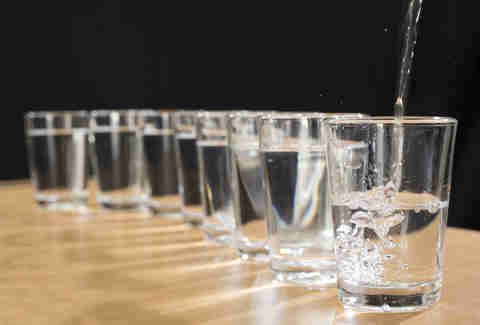 The “eight glasses a day” advice is loosely based on the “Adequate Intake” values published by the Institute of Medicine, which include water from fluids and foods combined. But those numbers only tell us how much water people tend to have (based on national nutrition surveys), not how much water we should have. As long as you have drinking water on hand, let your body's trusty thirst mechanism do its thing. The main goal is to replenish the water you lose, so if you're sweating more because you're pumping out reps at the gym or because it's a hundred degrees out, you'll naturally want to hydrate more. Pee wouldn't be known as yellow if it were really supposed to look like water. Pale yellow pee -- some say “straw-colored” -- is where it's at. Your kidneys produce pee by filtering waste out of the blood and into the urinary tract, and urochrome (which makes pee yellow) is one of the substances that ends up there. The kidneys are also responsible for water balance. If your body's water supply is low, very little water is allowed to exit with the waste -- your pee is more concentrated, and therefore darker, meaning that you could use some hydration. If you're already well hydrated, your kidneys ensure that the extra water comes out, resulting in that coveted straw-colored pee. Unfortunately, there is. Water intoxication, or hyponatremia, occurs when the sodium in your blood gets diluted by too much water coming in too quickly. The kidneys are usually pretty damn good at making sure everything is balanced. You drink more, you pee more. Everyone’s happy. But when you chug lots of water in a short time, the sodium concentration in the blood goes down, and water moves into the cells from the blood to counteract this change. When too much water enters the cells, they swell, which is dangerous -- in the case of brain cells, swelling can be fatal. The issue of overhydration has recently been highlighted in The New York Times, and a statement from the Third International Exercise-Associated Hyponatremia Conference (yep, there’s a special conference for everything!) was published this summer -- so prevention and treatment have certainly been getting more attention. The toxic level depends on body weight, but we're talking more than a gallon in a short time. That's a lot, but it's something to be aware of. It’s not just beer. In fact, all alcohol makes you pee -- sorry! 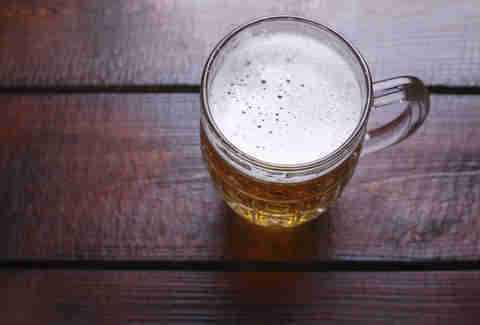 It does feel like you’re heading for the bathroom more often on a beer-only night, but that’s only because you’re drinking a higher volume of beer than, say, tequila (we hope). You've probably heard that caffeine, like alcohol, is a diuretic that causes the kidneys (in a different way than alcohol) to allow extra water out when you pee. 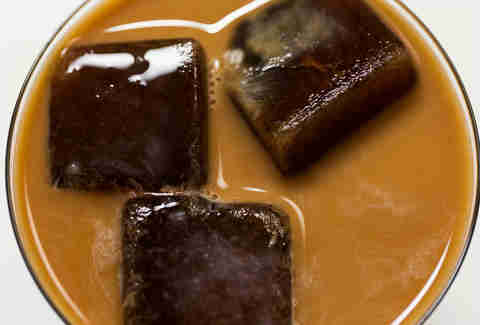 But recently, a well-regarded study in the UK showed that a moderate amount of caffeine doesn't seem to dehydrate you. Regular coffee consumers spent four days drinking four cups of coffee per day and four days drinking a caffeine-free placebo, and researchers measured how hydrated they were. Joe addicts clinked mugs when the findings came in: They were equally hydrated, regardless of caffeine consumption. Good to know, but it's also worth keeping in mind that while results were statistically significant, they came from only 50 male participants who were already used to drinking three to six cups daily. They also lived in the not-so-sunny UK and weren't allowed to work out or drink alcohol. Eliminating other causes for extra water loss was how the researchers made this a controlled trial, but it doesn't describe most of our lifestyles -- there was no chance to see how coffee, exercise, and drinking might act together. Moral of the story? A cup or two shouldn't be an issue, but don't go trading your water bottle for an insulated mug. Marina Komarovsky is a freelance writer for Thrillist, and she was never willing to believe that coffee was bad for you in the first place. For more on water and food and such, follow her tweets: @MariKomarovsky.